When I was a kid, I spent many a winter and spring break with my maternal grandparents in Arizona. Oh, how I loved those vacations. Recently, I was thinking about how much I miss my grandparents. 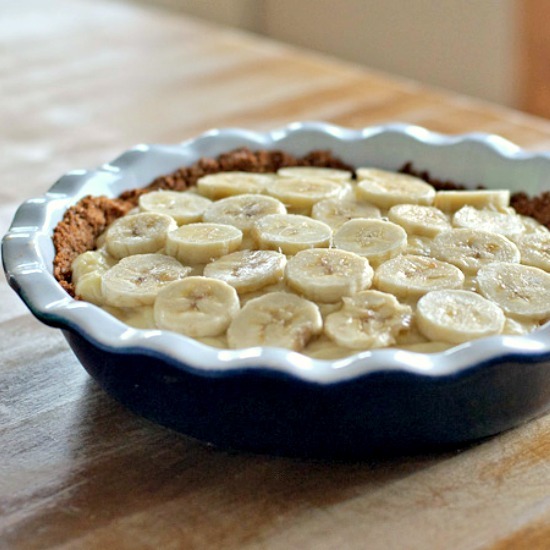 Missing them made me crave banana cream pie something fierce, so I decided to make one. My grandma made her pie with a store-bought crust and vanilla pudding from a box: I thought it was the most delicious thing ever, but I opted to make mine with whole foods ingredients from scratch. (I used the recipe in Joy of Cooking because that’s where I turn for classic recipes.) My daughter helped me make it by slicing the bananas and placing them “just so”. The verdict? It was pretty darn delicious and I will definitely be making banana cream pie again! Maybe next time I will change it up a bit, though…see the bottom of this post for some amazing-looking banana cream pie variations from fellow bloggers. You can make a crust using cookie crumbs instead of graham cracker crumbs: I may do this (and use either vanilla or chocolate cookies) next time. If you are interested in making your own graham crackers, try this recipe from Smitten Kitchen. For a gluten-free graham cracker recipe, you can try the one in this post. Be warned: this pie doesn't slice neatly! The crust is pretty crumbly and the filling is pretty wobbly...we happily spooned our individual servings into bowls. 2. In a medium bowl, combine the graham cracker crumbs with the melted butter, sugar, and cinnamon. 3. Using your fingers, press the graham cracker mixture firmly against the bottom and sides of a 9-inch pie dish. Bake for 10-15 minutes, until golden brown, then cool completely. 1. In a heavy saucepan, whisk together the sugar, cornstarch, and salt. Gradually whisk in the milk, then whisk in the egg yolks. 2. Bring the mixture just barely to a simmer while stirring constantly with a wooden spoon. 3. Remove from the heat and whisk until smooth, scraping the corners of the saucepan well. 4. Return to the heat and bring back to a simmer. Cook for one minute while whisking constantly, then remove from the heat and whisk in the butter and the vanilla. Allow to cool slightly (the filling does not need to be cool to fill the pie; in fact it is better if you do not allow it to cool too much). 5. Thinly slice 2-3 ripe (but not overripe) bananas. 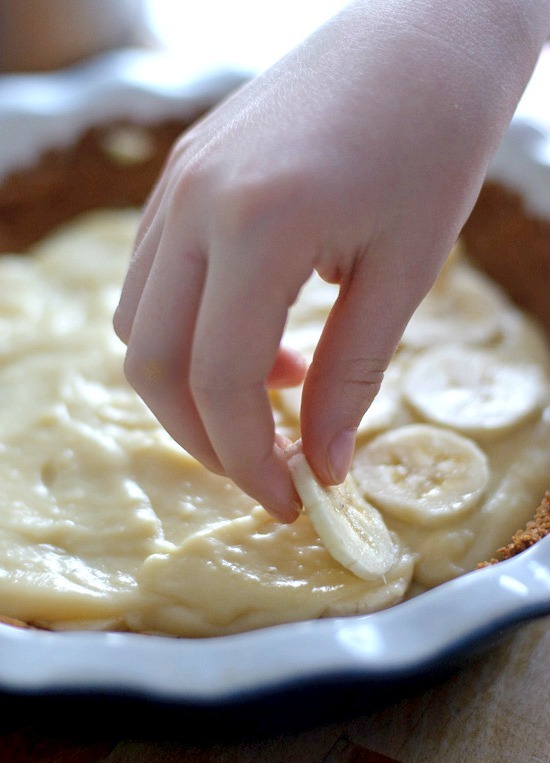 Spoon 1/3 of the filling into the crust and place 1/3 of the bananas on top. Add another 1/3 of the filling and then more bananas. Finish with the last of the filling and the rest of the bananas. You can top with homemade (or store-bought) whipped cream, if you like. Adapted slightly from Joy of Cooking . 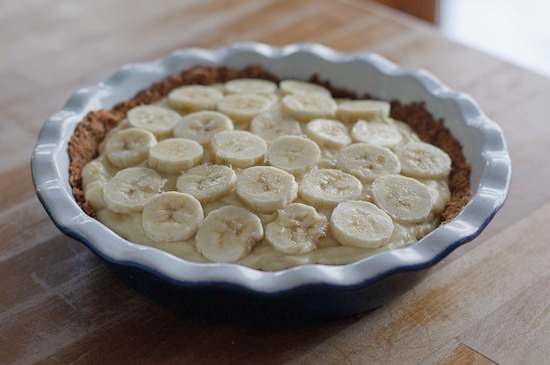 Banana cream pie is my favorite, but I’ve never made my own…I must try it! Happy Pi Day! I just love old family recipes, that really remind you of a certain time or place :) This looks like a tasty pudding! My parents made wonderful banana cream pie from store bought pie crust, boxed vanilla pudding, nilla wafer and non-dairy whipped topping and I also thought it was the best! I love it and now I think I’ll make it after Passover! 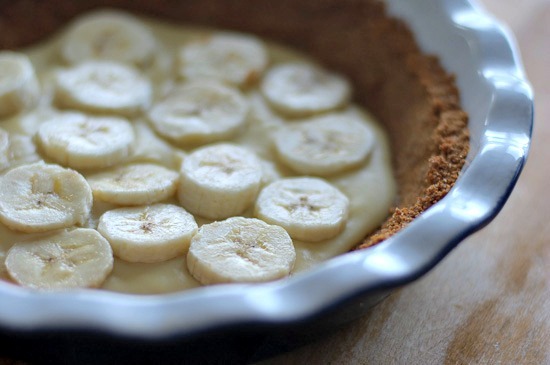 Banana cream is my favorite pie! I especially love the ones with fresh bananas inside! Can’t wait to try your recipe! Thanks!